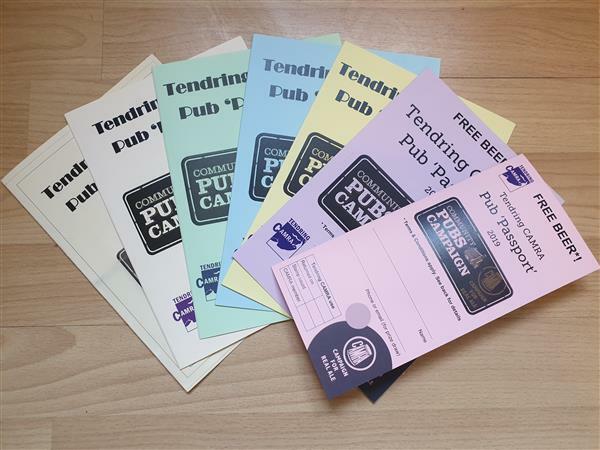 Tendring CAMRA's community passport scheme has been running now for a number of years. We first ran our passport scheme in Community Pubs Month in April 2012. It ran for just one month, and included 28 pubs that weren't featuring in any of the other events we were running that month (which included pub treasure hunts in Harwich and Brightlingsea, and the Morris Traveller event). The prizes in that first year formed the basis for later years; free admission and glass at one of our beer festivals for 8 stamps, plus a free pint if you got 16 stamps, and a further free pint for 24 stamps. After a year off in 2013 and based on feedback from that first year we re-launched the scheme in 2014 to run from April to July, increased the number of pubs included to 35, and added an extra free pint and a prize draw entry for those who got 32 stamps (or more). To date this has been an engraved tankard. The number of included pubs increased to 42 in 2015 (though we only had 41 in 2016 for some reason), and increased again to 49 in 2017. In 2016 Community Pubs Month got postponed until November after all the passports had been delivered (it was later postponed from November to the following April) so 2016 passports spoke about something which wasn't entirely accurate. 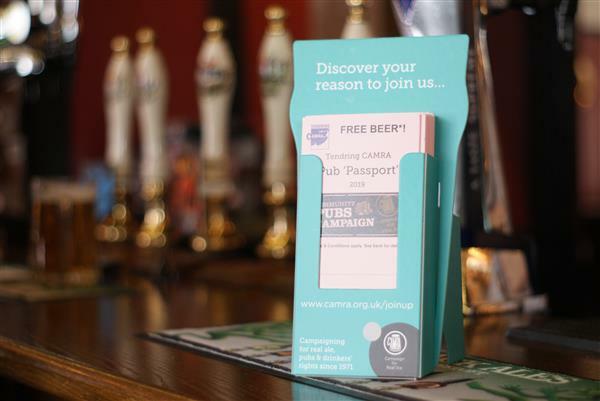 After 2018 CAMRA discontinued Community Pubs Month as a national event, leaving individual branches to campaign for their local pubs in a month of their choice. If a pub has received their passports before 1st April it is OK to have them on display and stamp them for customers, as long as those customers are aware that not all pubs might have them before 1st April so they might not want to make long distance trips to get a stamp on the off-chance. This year's scheme is again planned to run from the beginning of April to the end of July. Click here to see the participating pubs. The 2018 passport page is available here. 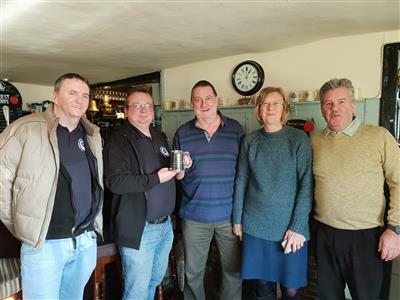 Presenting a tankard to Newt, winner of the passport prize draw at the 2018 Harwich and Parkeston Winter Ale Festival, at the Ship, Kirby-le-Soken, 30/01/2019. Presenting a tankard to Steve, winner of the passport prize draw at the 2018 Clacton Real Ale & Cider Festival, at the Royal Marine, Walton-on-the-Naze, 18/11/2018. The 2017 passport page is available here. 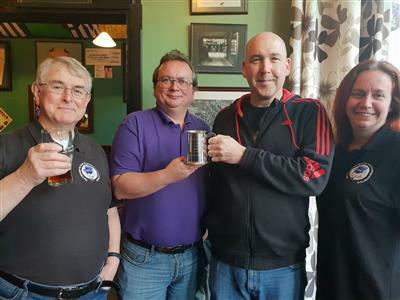 Presenting a tankard to Nick, winner of the passport prize draw at the 2017 Harwich and Parkeston Winter Ale Festival, at the Cross Inn, Great Bromley, 09/03/2018. Presenting a tankard to John, winner of the passport prize draw at the 2017 Clacton Real Ale & Cider Festival, at the Old Lifeboat House, Clacton-on-Sea, 05/10/2017. The 2016 passport page is available here. 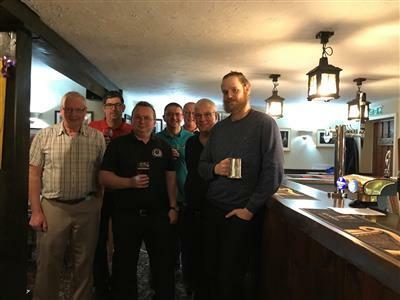 We didn't get a photo of Stella, the winner of the 2016 draw at Harwich; we had arranged to present the tankard to her at our March 2017 meeting at the Rose and Crown in Thorpe-le-Soken, but by the date of the meeting she'd moved to America and we sent it by post. Presenting a tankard to Graham, winner of the passport prize draw at the 2016 Clacton Real Ale & Cider Festival, at the Old Lifeboat House, Clacton-on-Sea, 30/11/2016. The 2015 passport page is available here. The Harwich and Dovercourt Winter Ale Festival was cancelled at short notice in 2015 so no draw could be made. 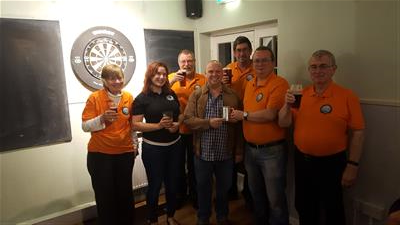 Presenting a tankard to Paul, winner of the passport prize draw at the 2015 Clacton Real Ale & Cider Festival, at the Railway Tavern, Brightlingsea, 14/10/2015. The 2014 passport page is available here. 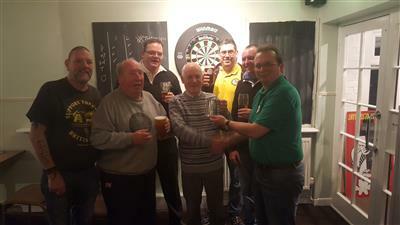 Presenting a tankard to Bill, winner of the passport prize draw at the 2014 Harwich and Dovercourt Winter Ale Festival, at the Cross Inn, Great Bromley, (when?). Presenting a tankard to John, winner of the passport prize draw at the 2014 Clacton Real Ale & Cider Festival, at the Red Lion, St Osyth, (when? ).